StackNET® is more than a set of robust Ethernet switches. StackNET® is family of high-reliability managed and unmanaged Ethernet switches, routers, and compatible power supplies and computer modules able to be configured based on the needs of the user application. Final configurations can be upgraded with additional functionality as necessary. Below, learn more about the various elements that make up a StackNET® embedded IoT solution. RTD's StackNET systems are made possible by an elegantly designed family of inter-compatible Ethernet switches in a PC104 format. 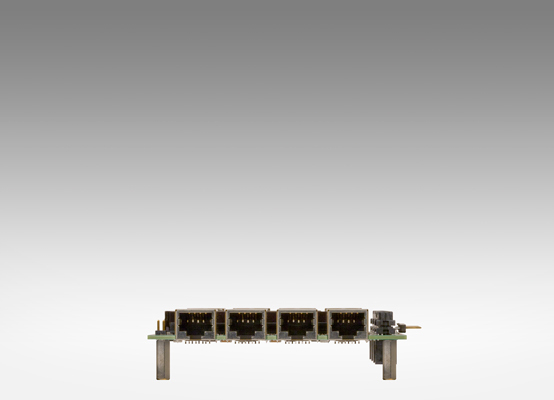 Available in managed and unmanaged flavors, with 10-pin header or RJ-45 jack options, these passively cooled gigabit Ethernet switches offer a system designer plenty of flexibility. Shown here: a managed host (bottom) with an expansion module (top). 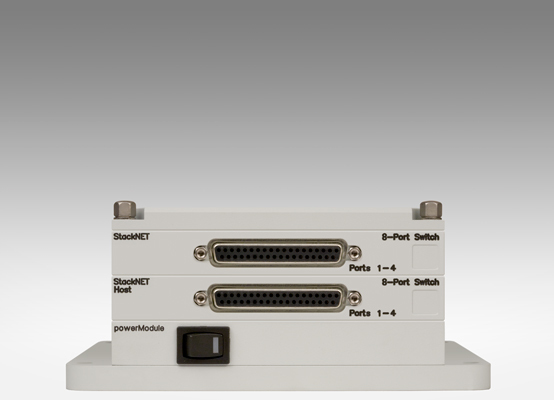 Perpendicular to the three‑bank PCI Express connector is the StackNET connector which creates direct board‑to‑board Ethernet connectivity throughout the stack. These managed Host and Expansion modules are configured with RJ-45 jacks. The Host includes a power connector on the south side of the board. The Expansion Modules link to the Host through a connector on the bottom side of the board. These managed Host and Expansion modules are configured with 10-pin headers. The Host includes a power connector on the south side of the board. The Expansion Modules link to the Host through a connector on the bottom side of the board. These unmanaged Host and Expansion modules are configured with RJ-45 jacks. The Host includes a power connector on the south side of the board. The Expansion Modules link to the Host through a connector on the bottom side of the board. These unmanaged Host and Expansion modules are configured with 10-pin headers. The Host includes a power connector on the south side of the board. The Expansion Modules link to the Host through a connector on the bottom side of the board. View the technical datasheets on RTD's parent website. 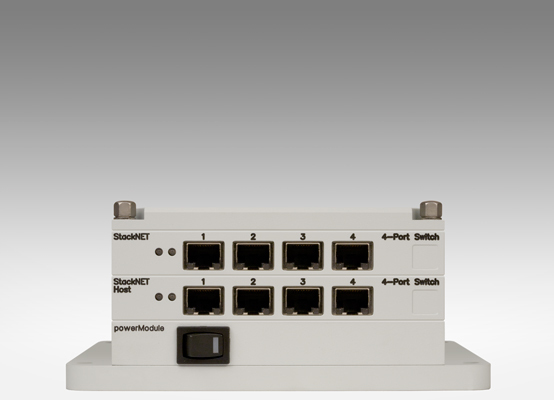 StackNET Ethernet switches are available as managed or unmanaged switches with RJ-45 jacks, or 32-pin D-sub connectors. Systems can be configured with any combination of the four unit varieties. The Host unit is the primary building block of StackNET. The Host offers an Ethernet connection to an optional CPU through the PCIe/104 (PCI Express) bus. 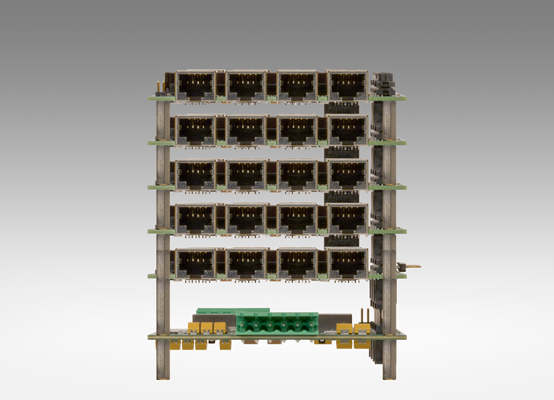 The switch system can be expanded multiple times by adding Expansion units. For example, a 32-port Ethernet switch can be configured with a power supply, an 8-port D-sub Host, and three 8-port D-Sub Expansion units. RTD StackNET pairs with Cisco's ruggedized embedded router. 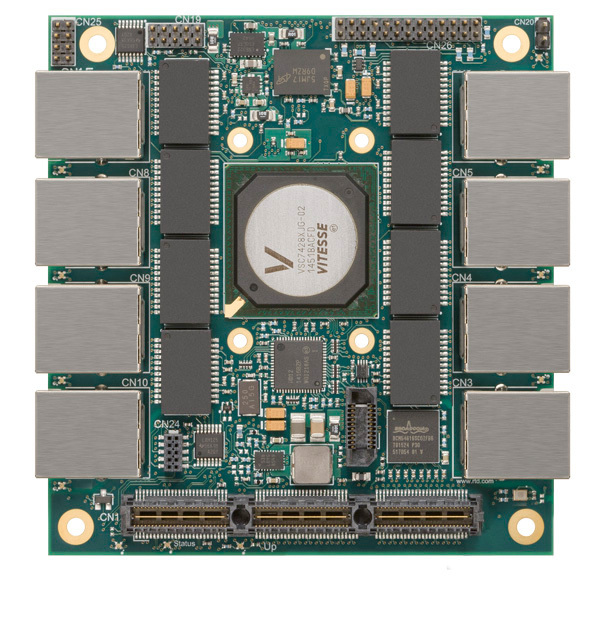 This router enables the deployment of Cisco Mobile Ready Net capabilities in mobile, air, ground and unmanned applications. A complete overview of the Cisco 5915 router can be found on the Cisco website. 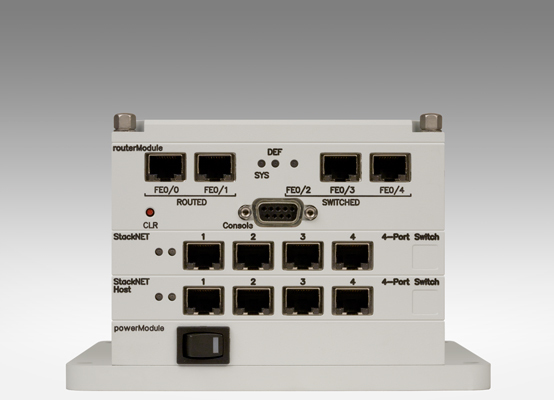 StackNET 8-port managed Ethernet switch with RJ-45 jacks. Each unit includes a timer tick jack, and eight Ethernet ports (four on front side of the enclosure, four on the back). 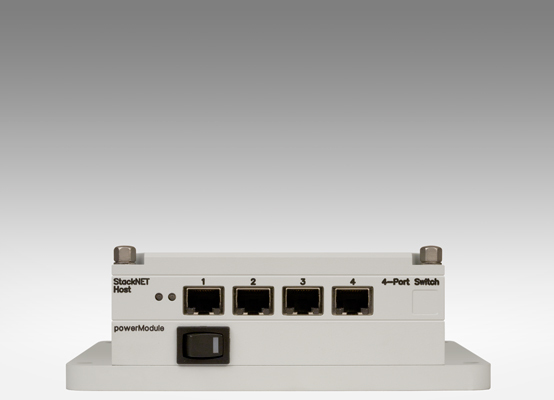 StackNET 4-port unmanaged Ethernet switch with RJ-45 jacks. 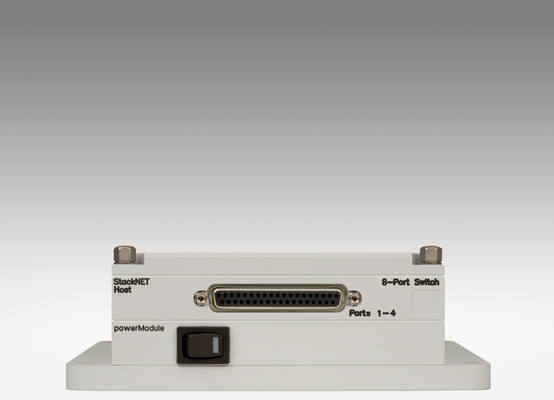 Each unit includes four Ethernet ports on the front side of the enclosure. 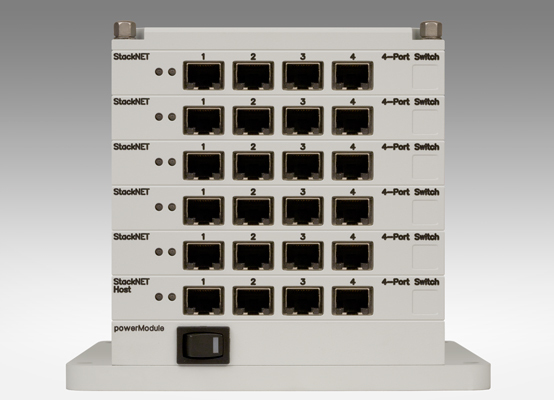 StackNET 8-port unmanaged Ethernet switch with 32-pin D-sub receptacles. Two D-subs are mounted on each frame (one on the front, one on the back). StackNET configuration for the Cisco 5915 Embedded Services Router. RJ-45 jack Ethernet connections and D-sub console port. 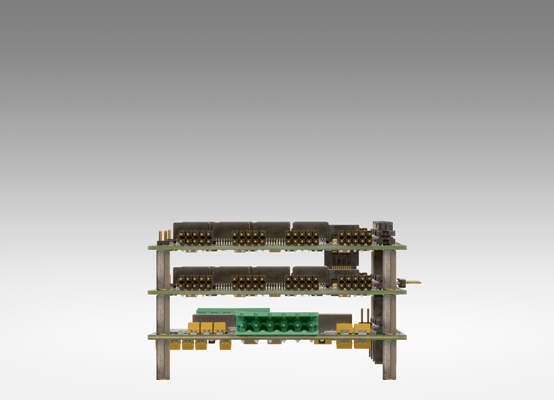 StackNET is compatible with RTD's wide selection of peripheral modules. 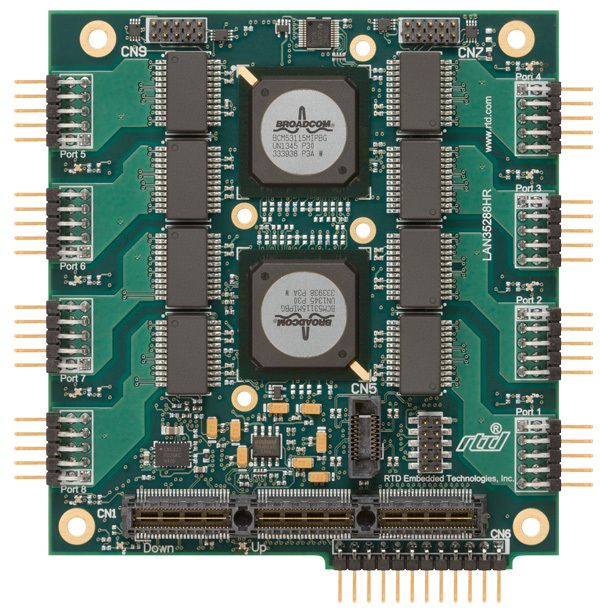 In addition to single board computers (SBCs) and power supplies, users can add other special purpose modules to add WiFi, GPS, USB, FireWire, DSP, storage, mini PCIe, data acquisition, and more. Select from RTD's full line of compatible products on our parent website, www.rtd.com. 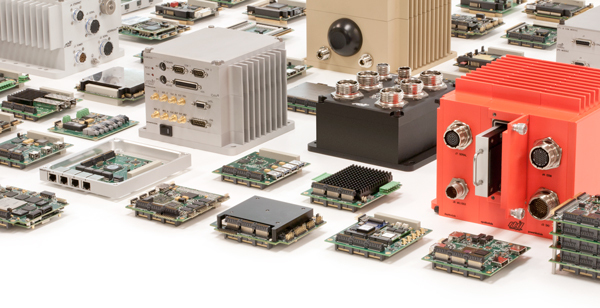 Explore our complete line of embedded modules and systems at www.rtd.com. Copyright 2015 - 2019. RTD Embedded Technologies, Inc. All rights reserved.